A week ago we decided to write a short story about Glenn H. Curtiss and the development of the famous Curtiss water cooled engines of the early 1900’s. I have to admit that my knowledge about Curtiss and the development of the Curtiss series of engines was limited at best, although I was aware of some his his achievements as a pioneer in the aircraft industry, as well as his early motorcycle speed records. And of course we know that the Curtiss OX-5 V-8 was used by some of the early wooden boat manufacturers such as the Indian Lake Boat Company / Dart Boats in the 1920’s & 30’s. However, what I didn’t realize (until last week) was just influential Glenn H. Curtiss was, not only as a pioneer in the early days of the aircraft industry, but the history of the man and his accomplishments – it’s truly remarkable. So remarkable in fact, that it’s impossible to even begin to describe his accomplishments in a short story. 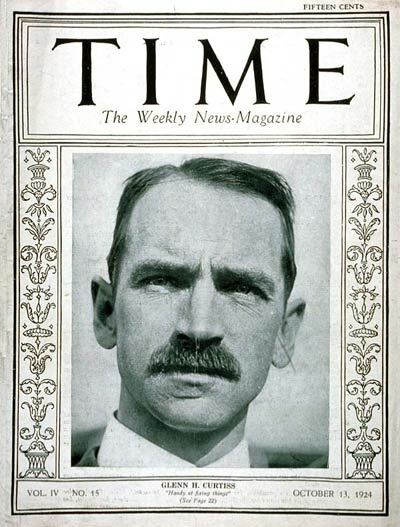 There is so much information that has already been documented on every aspect of his relatively short life (and over the last 130 years), that my attempts to learn more about Glenn Curtiss resulted in me getting lost on the Internet for hours and hours over the last week, as I learned more. It was almost like reading a good book that you just couldn’t put down. So finally we thought the best way to keep the Glenn H. Curtiss story as short as possible was to simply publish a list of his accomplishments (thanks to our friends at Wikipedia), add a few links to some of the historical information, and fill in the blanks with a few vintage images. He began his career as a bicycle builder, then a motorcycle builder and racer, later also manufacturing engines for airships as early as 1906. In 1908 Curtiss joined the Aerial Experiment Association (AEA), a pioneering research group founded by Alexander Graham Bell at Beinn Bhreagh, Nova Scotia to build flying machines. In 1907 Curtiss rode the world’s first V-8 powered motorcycle to a land speed record of speed of 136 miles per hour in Ormond Beach, Florida. Having riden the motorcycle faster than even the typical locomotive of the day, he became known as “The Fastest Man on Earth.” That same year in June, he flew over Hammondsport, NY in a Thomas Baldwin dirigible powered by a Curtiss engine. This was the very first time that Curtiss went aloft in any sort of aircraft. After alighting from the craft, he was now so interested in human flight that he soon started planning how to make the dirigible fly faster. Curtiss rose to fame by making the first officially witnessed flight in North America, winning a race at the world’s first international air meet in France, and making the first long-distance flight in the United States. His contributions in designing and building aircraft led to the formation of the Curtiss Aeroplane and Motor Company, now part of Curtiss-Wright Corporation. His company built aircraft for the U.S. Army and Navy, and during the years leading up to World War I, his experiments with seaplanes led to advances in naval aviation. Curtiss civil and military aircraft were predominant in the inter-war and World War II eras. – 1905 Created G.H. Curtiss Manufacturing Company, Inc.
– 1909 Sale of Curtiss’s “Golden Flyer” to the New York Aeronautic Society for $5,000.00 USD, marks the first sale of any aircraft in the U.S., triggers Wright Brothers lawsuits. – 1909 First U.S. licensed aircraft manufacturer. – 1911 Developed first successful pontoon aircraft in U.S.
– 1925 Builds his Miami Springs mansion. – 1928 Created the Curtiss Aerocar Company in Opa-locka, Florida. Throughout his life, Glenn Curtis designed a number of unique flying boats for the US Military. Here’s one of his earlier versions – the Curtiss MF Model, which was powered by a 90HP OX-5 V-8 similar in structural design and power of the JN-4 “Jenny” from around 1918. In April 2010 this vintage 1917 Curtiss MF Seagull Flying Boat sold at auction in New York to an anonymous phone buyer for a reported 506,000.00 US. When Bonhams New York listed the unique piece, it was estimated to sell at between 300K to 500K. The Curtiss OX-5 was an early V-8 American liquid-cooled aircraft engine built by Curtiss. It was the first US-designed engine to enter mass production, although it was considered obsolete when it did so in 1917. It nevertheless found widespread use on a number of aircraft, perhaps the most famous being the JN-4 “Jenny”. Some 12,600 units were built through early 1919. The wide availability of the engine in the surplus market made it common until the 1930s, although it was considered unreliable for most of its service life. Today the engine can be found powering many Edwardian automobile racing specials on the historic racing scene. So by now you are probably thinking to yourself, what is the connection to Glenn Curtiss and Gar Wood in 1918 and what does all this have to do with wooden boats. Good question. In preparation for the 1918 Gold Cup race, Gar Wood wanted a better, faster boat. And the competition for the Gold Cup was growing. He talked to several engineers about putting an aeroplane engine in a boat. Marine engines were heavy. Gar Wood wanted a light fast engine on the old theory of light weight per horsepower. The engineers were skeptical, advised against it. They thought it was the creation of a mad brain. Wood knew that Glen Curtiss, of the Curtiss Engine Company, had been using an aeroplane engine in his Miss Miami, a boat that had traveled fifty-five miles an hour with an air propeller. Curtiss had been given an order by the British Navy during the War to build a twelve-cylinder V-type engine of light weight and high power. He built several of these engines. They were all rejected by the British Navy and Curtiss had sustained a tremendous loss. Commodore C. D. Cutting, a friend of Glen Curtiss, told Gar Wood he thought he could get one of those engines. Wood said, “Fine. I’ll buy it if you can.” – Cutting got the engine for Wood. It was shipped to Wood’s plant in Detroit. Through the entire winter Wood worked on it. Before he finished he had increased the propeller revolutions from 1,650 per minute to 2,000. He also decreased the engine weight from 1,320 pounds to 1,250 pounds. That was four hundred pounds less than the weight of the Sterling engines in his “Miss Detroit II.” Wood, satisfied, told the Smith boys to start work on a new hull. They climbed into their overalls, rolled tip their sleeves and went to work. They’d done that before, many times. The thing they created was a masterpiece. The “Miss Detroit III” was made out of seven different kinds of wood, the finest speedboat ever shaped by human hands up to that time. It was built to ride entirely out of water from the bow back to the step. It was powered by the Model V-4 light weight Curtis V-12 cylinder engine. From 2000 to 2005 Mike Michaud from Maine built a beautiful replica of the historic “Miss Detroit III” Chris Smith / Gar Wood 1918 single step hydroplane. Below are a few photos of the boat which was completed and lauched in the summer of 2005. You can see the complete story od Mike and the replica project by clicking here, you go to the Vintage Raceboat Shop website. The “Miss Detroit III” replica then came up for auction at the Warner Collection Auction in 2010. Long time hyrdoplane driver, team owner and enthusiast Dr. Ken Muskatel purchased the boat at the auction and returned it to the Hydroplane and Raceboat Museum for display purposes. It was also shown at the 2011 Lake Tahoe Concours d’Elegance with the twin V-6 Chevrolet power that Mike Michaud installed. Ken Muskatel is also the Past President of the Hydroplane and Raceboat Museum near Seattle, Washington and continues to support the museum. Ken’s guidance and contribution to the Museum is immeasurable. Approximately 20 years ago, Ken Muscatel purchased one of the two remaining 1916 Curtiss Model V-4 engines known to exist from an antique car museum. The only other example known to exist is on display at the Smithsonian Air & Space Museum in Washington, DC. With the help of fellow Woody Boater and hydroplane enthusiast Ike Kielgass, Ken is now in the final stages of restoring the ultra rare Curtis V-12 to be installed in the “Miss Detroit III” later this summer. The engine restoration work was entrusted to Robert Mishko at Rocky Summit Performance in Tennessee. Here are a series of very interesting photos of the Curtiss V-4 restoration project from Mishko’s shop. Robert Mishko commented when he began the rare Curtiss engine restoration how cool it was to think that he was the first person to open up this motor after almost 100 years had passed. And from the photo’s it appears to be in great shape for it’s age. Ike Kielgass was able to also locate a set of ultra rare 1920 Stromberg M-4 carburetors which are correct for a marine application of this vintage. When I spoke to Ike last week he indicated that they were hoping to have the Curtiss V-4 completed later this summer and then get it installed in “Miss Detroit III” in time to water test it later this year. The boat may be used for some limited demonstrations in conjunction with a few Hydroplane and Raceboat Museum events, and then it will be displayed in the museum for everyone to enjoy and appreciate once again. You can also click here to visit the awesome Hydroplane and Raceboat Museum website. Thanks to Dr. Ken Muskatel and Ike Kielgass for sharing this story with us, and we look forward to the day “Miss Detroit III” is completed with the big Curtiss V-12 power and back in the water. That may require a special bike ride to see and hear the re-launch. Also, if you are ever in or traveling through the Finger Lakes region of upstate New York, plan to stop by the Glenn H. Curtiss Museum in Hammondsport, NY. Here’s the link to thier website. Hammondsport, NY / Lake Kauka is where our friend and fellow Woody Boater Mike Mayer (from Lake Oswego Boat Co) is from, and his father – Legendary “Hank the Plank” still resides there at his boat shop. If anyone travels to the Fingerlakes region, stop by the Glenn Curtis museum in Hammondsport. His contributions to aviation are way under recognized. The Wright brothers managed a brief virtually uncontrolled hop with the aid of a strong head wind. Curtis was able to take off manuever in flight and then land back where he started, the first true powered flight. Then there is his contribution to motorcycles (grip throttle) boats, and internal combustion motors in general. It is odd that he is not far more well known. Thanks for the great curtis story, Texx. Many readers may not realize there is another connection to wooden boating beside the use of the OX 5 in boats (by the way as you know our friend Paul Harrison has one-is there anything he doesnt have?). That is the beautiful woodwork in the cockpits of planes. My grandfather had a Curtis Oriole when they started private production of these in the early 20’s, and the interior would put any wooden boat to shame. There is a reason these were called airships in those days. Many of the early workers in the production of planes, such as in the case of Boeing, were recruited from ship building because of their woodworking skills. Thanks Don. The contribution that Glenn Curtiss made to the aviation industry and to his country is truly remarkable. Look closely at that V-12 engine, the oiling system and connecting rods, and realize that was all designed and built long before modern technology, with crude tools and instruments. Yes, amazing. One thing they hadnt figured out, however, were valve covers! Man that connecting rod shot is so hot.. Who needs Donzi girls..I now know more about Curtiss than I do about my own wife! I am sorry Honey, I forgot your birthday… But did you know that in 1911 Curtiss Developed first successful pontoon aircraft in U.S… Really.. Honey.. honey.. The only thing cooler than a boat is a FLYING boat. And then there are wooden flying boats! The thing is, the insurance premiums each year make a new 5200 bottom look like a bargain. And that’s before maintenance and operating costs. An amphib flying boat even makes a standard land plane ownership seem cheap (and safe!). And then they flew the flying boats over the Atlantic Ocean! Texx, that was anything but dry. I love reading about extraordinary people like this, regardless of their field(s) of expertise, and their seemingly endless list of world-changing contributions. What this guy did in 1910 alone was so amazing and humbling, it was almost hard to read on. I don’t get as worked up about old, rare, and expensive boats and motors as some people do. But this is different. Curtiss’s achievements are so much more than that. They are pioneering marvels by any measure in any time. Thanks so much for writing this. Oh, and Matt. Who needs Donzi girls? I need Donzi girls. Chris-Craft girls too. Alex – Here’s a Chris-Craft Gal just for you. One of the fascinating things about the woody boater blog is where the threads migrate! Memo to WoodyBoaters with young kids (say, ages 4-16). Among the wonderful, feature length animated films created by the immensely talented Japanese director Hayao Miyazaki of Studio Ghibli is a 1992 film called Porco Rosso (translation, “Crimson Pig”). The main character of the film is a WWI-era ace fighter pilot, a man with pig-like features owing to a curse. The film is centered around cool vintage seaplanes and the characters who fly them. Porco’s nemesis is a man called Curtis, a name clearly selected because of the contributions to early flight and seaplanes by the very Glenn H. Curtiss in today’s story. Don’t expect anything historically accurate in the film. It’s all good fun. In fact, the Curtis character is an incorrigible egomaniac. But the film has a wonderful story, is visually inspired, is beautifully scored, and carries positive messages about honor. It’s simply delightful. Bill, you’re spot on. Funny you mention Tesla. I, too, was thinking of him when I read about Curtiss. My kids and I watched a biography of Tesla several months back. He was amazing! You mention some of his important patents. The bitter, high-stakes battle he had with Edison over whether the U.S. would be electrified AC (his choice) vs. DC (Edison’s choice) floored me. We all know who won. Can you imagine taking on Edison? But did you know about his contribution to radio? While Marconi received the credit, it was Tesla who made radio possible. In fact, in 1943, the Supreme Court overturned Marconi’s patent in favor of Tesla. Like many of the brightest stars, he walked a fine line between brilliant and insane. Though he lived a long life, he suffered greatly for his overactive mind. Texx, I think your story is missing one thing. A close up of Curtiss. It’s always amazing to look deep into the eyes of a visionary. Here are three. Mike Mayer is related to Fred “Hank the Plank” Mayer? You learn something new here every day! it’s true, m-fine…I was born MikeM the Plank, but once in grade school the teasing was too much so I shortened it to MikeM. NY state wasn’t large enough for the two of us so I moved to the great wine region of Oregon. Great story, Texx. I’ve been to the museum several times and have read many books on Curtiss…quite a man. What a great story, My wife and I will be stopping by the museum on the way to Clayton this year. It’s amazing to me that he did so much for aviation but you mostly only hear about the Wright Bros.
What a brilliant story!! Thanks. I will forward this to my friend Gene at The Vintage Aviator. He’s going to love it. I went to that museum in Hammondsport and it is just fantastic. They have the scale just right…not as overpowering as the Mariners Museum for instance. They have actual planes that they work on in there and fly right out back. The displays of original hardware and vehicles is unreal. UNREAL is the word for Glenn too. Went 136 MPH on hard pack sand on a V8 motorcycle….he built the engine…and lay prone above it as he became the fastest (and bravest/craziest) man on earth. Chris and Gar was a team and a rivalry….but Glenn Curtiss and the Wright Brothers was the VARSITY GAME. John – I agree, going 136 MPH in 1907 on wet sand with what was probably an ill-handling motorcycle was quite an accomplishment. As a life long motorcyclist and a professional motorcycle roadracer for many years, 136 MPH on pavement with todays well handling motorcycles, with tires designed for these speeds will get your heart racing even today. Who put the quarter in Alex today? You’ve raised the bar again Texx….. Hang around Hammondsport and the folks at the Curtis museum and this is the type of thing you may see. We are truly blessed to live in an area that now only has such a rich history, but also has the people who keep it alive so you can experience it and not just see pictures in a display case. The local scenery is not to bad either, from the air, or from the water. Here is an inside view for a ride over the lake with the same pilot but in a “post war” flyabout. The danger of flying these rickety historical aircraft hit home real hard for us back in June 2010 when this pilot, Jim Poel, was seriously injured in a crash of a replica of the 1910 “Albany flyer”. Curtis flew the Albany from Albany NY to NYC, the first true cross country trip by air plane. The museum was going to try to recreate the flight for the 100th anniversary celebration, but the plane crashed during flight testing out of the Penn Yan airport. Jim passed away a little over a year ago, and is missed by many in the Curtis community, the seaplane community, the aviation community, as well as the communities he lived in in western NY and Florida. I get fascinated in this kinda stuff as well . . .More stories like this please. Thanks Tim – We are currently working on an update to the original Curtis V-4 restoration story, which we hope to have published in the next few days. Stay tuned – the photos are spectacular!